Will begin by looking at the recent evolution in humans. Evolution is very much still happening today — and it's happening to us, right here, right now. Our genes constantly change over time thanks to the power of selection. a. All mammals (besides humans) stop producing lactase after weaning. b. Lactase is needed to breakdown lactose (milk sugar) in the body. c. This means that they will no longer be able to digest milk when they get older. d. Scientists have discovered a mutation that first appeared on the plains of Hungary about 7,500 years ago, that allowed some humans to digest milk into adulthood. e. The ability to digest protein-rich, calorie-dense, dairy products was a definite evolutionary advantage. f. We still see evidence of this genetic change today, in the fact that ~ 75% of humans are lactose intolerant. a. Sickle-Cell Anemia prevents Malaria. b. Sickle-Cell Anemia is most common in people of African descent (7%), and other areas where malaria is prevalent. ​ coldness in the hands and feet. a. about 10% of Europeans have a genetic mutation that protects them from HIV infection. b. This genetic mutation (known as CCR5-Ä32) prevents the virus from entering the cells . a. New research shows that people with blue eyes have a single, common ancestor. b. 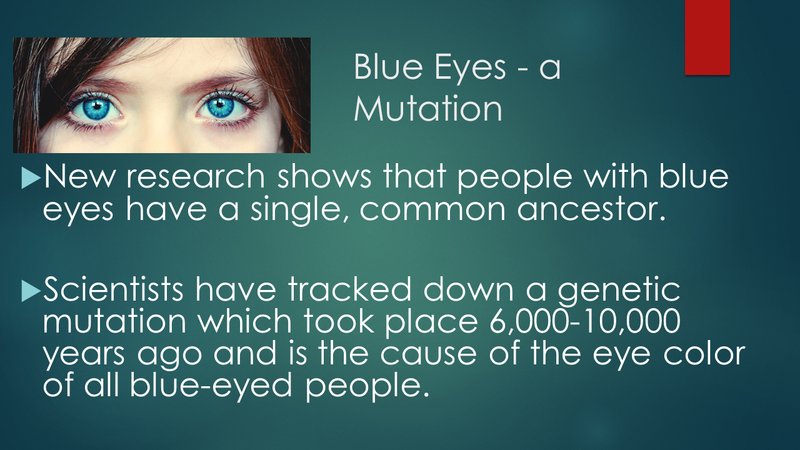 Scientists have tracked down a genetic mutation which took place 6,000-10,000 years ago and is the cause of the eye color of all blue-eyed people. c. Originally, everyone had brown eyes,. There was a genetic mutation in the OCA2 gene that adds melanin (pigmentation) to our eyes, that essentially turned the gene off. This caused a decrease in the melanin of the eye, thus turning blue. Green-eyed people have less melanin than brown eyes, but more that blue-eyes. a. Some people perceive millions of colors that remain invisible to the rest of us. a. Indigenous Tibetans, who live at altitudes above 10,000 feet in the Himalayan highlands, have blood that produces more of the oxygen-transporting hemoglobin protein. a. 25 % of humans today are born without wisdom teeth. b. A few thousand years ago, a mutation popped up that prevented wisdom teeth from growing at all. c. Humans stopped needing wisdom teeth after humans begin cooking food and developed agriculture thousands of years ago. d. This switch to softer foods, decreased the size of our jaw muscles. e. Cave men would wear out their molars and have room for the wisdom teeth to replace the. f. Most people don’t have room for them. a. We think pretty highly of our brains, but it turns out they've actually been shrinking for more than 20,000 years. There has been speculation as to why, but we don't know for sure. It is possible that as technology developed, people become less dependent on their brains. The total change adds up to a piece the size of a tennis ball in an adult male. a. Our appendix was used to secrete digestive enzymes that were needed to break-down our previous diet of cellulose-rich plants. a. Goose bumps really serve no purpose to modern humans, but when we were much harrier, they probably served the same function that the arrector pili serve in other mammals. The pili contract involuntarily when the mammal is either cold or feels threatened. This acts to keep the animal warm and to increase the size of its appearance to ward off danger. a.. Your coccyx, better known as your tailbone, is the very last part of your vertebrae, and is the remnant of a lost tail. We all have a tail bone. Most people know that. But did you know that you also carry genes that encode for a tail too? In the vast majority of people, these genes are essentially turned off by epigenetic factors. These genes, on occasion get "turned back on" and we get babies born with a tail-like appendage. Usually surgery is performed in infancy to remove the unneeded tail. Plato made the connection between form and function in organisms. In other words, the structure of a long pointy beak would allow the function of gathering and eating small burrowing insects. He believed the function of the organism was designed to achieve "ultimate goodness and harmony". Aristotle, believed that organisms changed over time striving toward what he called “the telos” (an ultimate object or aim). 2. Aristotle created the "scale of nature" which organized organisms into a hierarchy from "less perfect" to "most perfect". Of course, being humble, he placed mankind at the top. Goethe believed that each hierarchical level of Aristotle's "Scale of Nature" increased in complexity. Darwin proposed that inherited traits that were advantageous to survival, had a higher probability of being propagated to future generations. The result would be adaptation, evolutionary modification of a population that improves each individuals’ chances of survival and reproductive success in the environment occupied by the population. ​ have descended over time from common ancestors. The genetically inherited trait that increases the survival of that species would persist through the process of evolution by NATURAL SELECTION. The genetic trait that evolves from this process increases the probability that the species will survive in that particular environment is called an ADAPTATION. A classical example of natural selection is the Peppered Moth. The evolution of the peppered moth is a classical example of evolution due to natural selection. These moth's resided in London in the 1800's during the Industrial Revolution. At the beginning of the 1800's there were more light-colored Peppered Moths than dark-colored Peppered Moths. These moths would rest upon trees with white bark. The dark-colored moths were easier to spot against the light backdrop of the white tree bark and consequently were eaten more often by hungry predatory birds. The light-colored Peppered Moths camouflaged against the light-colored trees and were much more prevalent in the population. By the end of the 1800's the light-colored trees became dark to the extensive pollution (soot deposits), causing most of the light-colored moths to be more visible to predators and, therefore, This caused a shift in the population of moths in which dark-colored moths became more common. #1 High reproductive capacity. Each species produces more offspring than will survive to maturity. We only see the effects of natural Selection if some of the offspring survive to adulthood (breeding age) and some don't. #2 Heritable variation. The individuals in a population exhibit variation that is genetically inherited. Some traits improve the chances of an individual’s survival and reproductive success. The variation necessary for evolution by natural selection must be inherited so that it can be passed to offspring. #3 Limits on population growth, or a struggle for existence. Only so much food, water, light, growing space, and so on are available to a population, and organisms compete with one another for the limited resources available to them. Other limits on population growth include predators and diseases. #4 Differential reproductive success. Reproduction is the key to natural selection: The best-adapted individuals reproduce most successfully, whereas less fit individuals die prematurely or produce fewer or less viable offspring. Charles Darwin visited the Galápagos Islands off the coast of Ecuador. Among the species he studied, he studied 14 different finch species found on the island. Each finch species was unique with special adaptations that helped it survive it its environment. These adaptive traits were different from finches living on the South American mainland.6. The finch species, although similar in color and overall size, exhibit remarkable variation in the shape and size of their beaks, which are used to feed on a variety of foods. ​ surviving finch populations evolved through Natural Selection making them better adapted to their environments. Until the invention of the microscope in late 1590’s (by Zacharias (son) and Hans (father) Jansen), scientists thought there were only 2 broad categories of organisms on Earth (plants and animals). Scientists had to rethink this idea when they discovered bacteria (prokaryotic cells). Bacteria were distinctly different and separate from plant or animal cells. - Bacteria are prokaryotes. bacteria are single-celled organisms made up of a single prokaryotic cell. Prokaryotic cells lack organelles enclosed by membranes, and do not have a nucleus. The eukaryotes are organisms that are made up of one or more eukaryotic cells. Eukaryotic cells have the following characteristics. 2) animals – ingest food and digest it in their bodies. 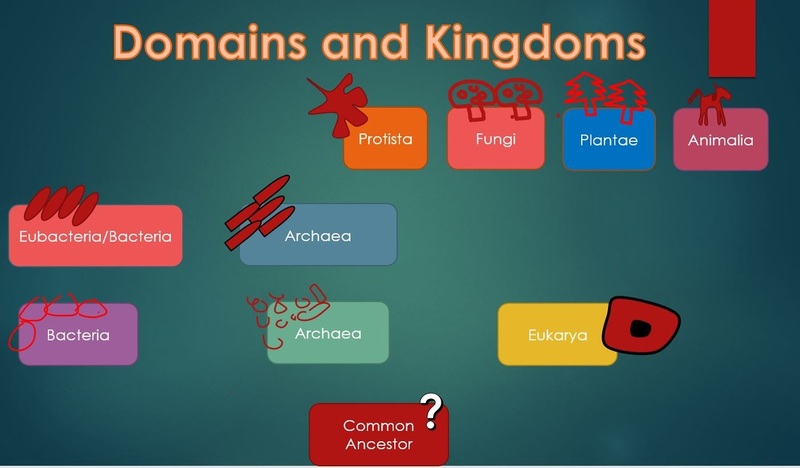 3) protists (Unicellular or relatively simple multicellular eukaryotes, such as algae, protozoa, slime molds, and water molds, are classified as members of the kingdom Protista. 4) fungi (molds and yeast) - secrete digestive enzymes into their food and then absorb the predigested nutrients. ​The blind cave fish is a great example of USE IT OR LOSE IT evolution. The blind cave fish is so named because of its lack of eyes! Hundreds of generations of fish ago, a fish, or group of fish, swam into the deep dark caves of Mexico. This could have been in search of food or to escape predators, or even both. The fish thrived in the new, dark environment and continued to live there in the darkness generation after generation. Over time, these fish stopped developing eyes. The energy that the fish would usually have had to spend creating the anatomy needed for sight, as well as for processing visual information, was now able to be reallocated to more useful functions. These fish also developed a type of sonar to assist their navigation in the dark, as well as other heightened senses.